The Choice: Hypocrisy or Real Christianity? 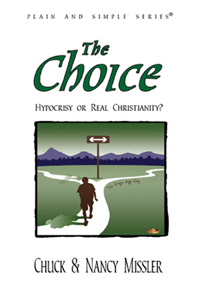 The Choice is an easy to read, non-threatening little book written especially for youth. So many of our young people see Christians as “hypocrites”. This book shares the secret to being real and transparent. It shows us how we can remove our masks, be genuine and a real living example of Christ. The question is: If we are really believers, why doesn’t Christ’s Life automatically flow from our hearts? What quenches His Spirit in our hearts? How can we love others genuinely when perhaps they have hurt or abused us? These are some of the questions and issues that this little book addresses. Authentic Christianity is not saying one thing and doing another. An authentic Christian is one who has the Life of Jesus showing forth in all that he does. He is not perfect, but when he does stumble and fall, he knows how to turn around and go God’s way. The Choice explains how to do this, moment by moment. PLUS a 31 page Supplemental Study: Seeing Ourselves. This is an introductory study of the “Temple Model” that describes how the human spirit, soul, and body function. This model helps explain how we are changed when we are born again, and especially how the Spirit of God works in us. Being a real Christian does not mean being perfect, but simply knowing how to relinquish ourselves to God, so that He can live His perfect Life out through us. Thus real Christianity is not rules, regulations, and taboos. On the contrary, real Christianity is the most freeing and unrestricted way to live that there is! Learn more about “The Choice” with these supporting materials.